First, make your grits. Run the chicken stock into a thick-bottomed saucepan and turn on high till it boils. Mix in the grits and stir like crazy. Reduce to a simmer and allow to cook for 40 minutes, stirring occasionally. Add cream if you need more liquid. Then tumble in the butter, drizzle in the rest of the cream and stir till it’s all in the family. Then shake in the shredded cheese and stir very well till it’s all nice and smooth. While your grits cook, bring a large saucepan to medium heat. Add bacon and cook for about 3 minutes, then add garlic and shallots. Sauté and then add butter and a splash of white wine. When the butter is half melted, add the shrimp. When the downsides of the shrimp become white, flip them and add mushrooms, scallions and spinach. Sauté for 2 minutes. Remove the shrimp. Pour in heavy cream and let simmer while stirring. When reduced by one third, add salt, pepper and hot sauce. Return shrimp to the sauce and combine. 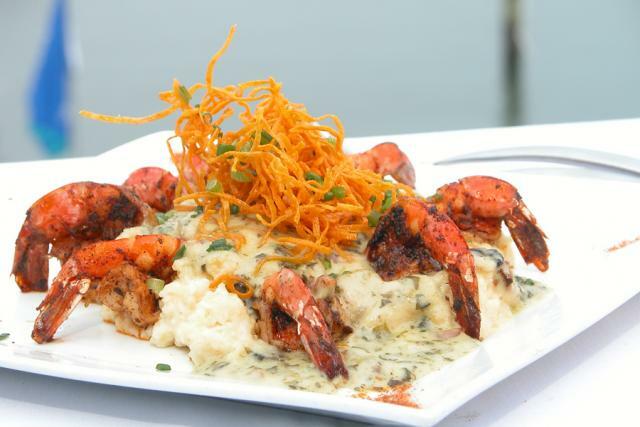 Spoon the sauce and shrimp onto heaping mounds of cheese grits.